You should keep in mind that the size and complexity of your organization, as well as the Office 365 plan you choose, will directly affect your implementation. If you are a one-person consultant or small business using the professional and small business plan, then your implementation will be very straightforward. If your organization contains thousands of employees with offices around the world, your implementation will be a bit more in depth and will require extensive planning. Regardless of your organization’s size and the plan you choose, your implementation follows three primary steps — plan, prepare, and migrate. Although it seems that the planning phase should precede the preparation phase, this is not so. 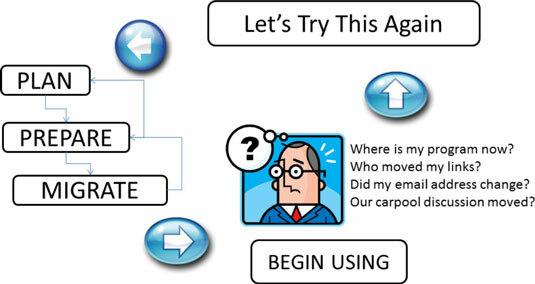 The best implementation processes follow an iterative cycle in that you continually plan, prepare, and migrate. You need to start somewhere, however, and you always start with a plan. 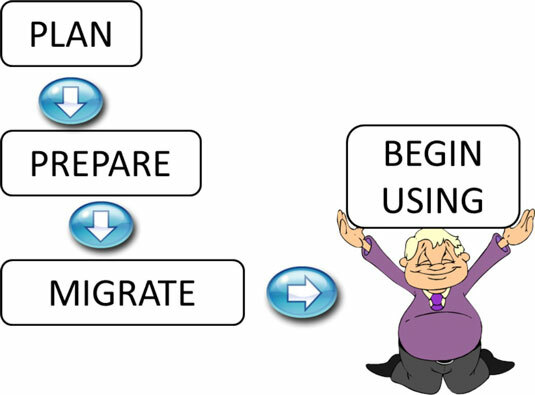 When you get your plan in order, you then move onto preparing to migrate. As you are preparing, you realize some additional things that you didn’t include in your plan. As a result, you continually update your plan. Perhaps a better representation of the process is shown here, even though this might not sit well with organizations that have extensive gating requirements for every project undertaken.